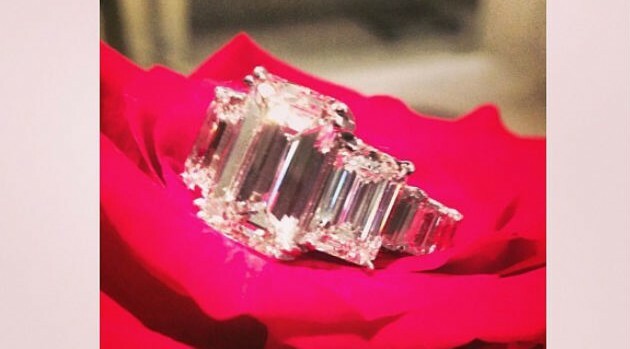 Courtesy of Ciara’s InstagramShortly after her engagement to Future went public, Ciara shared a picture of her lavish engagement ring via her Instagram account. The 28-year-old singer posted an image of the 15-carat emerald cut diamond ring, which cost more than half a million dollars, according to the jewelry retailer Avianne & Co.
After Future proposed during her birthday celebration in New York City on Sunday, Ci Ci shared another picture of a customized bottle of Moët Nectar Impérial Rosé, which reads “Happy birthday Ciara” on the label. Chris Chambers, a rep for the couple, confirmed to ABC News Radio their wedding date will be planned around Future and Ciara’s busy schedules.